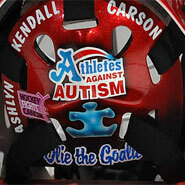 Washington Capitals goalie Olaf Kolzig is inspired by his son Carson's battle with autism, which led him to form the non-profit organization Athletes Against Autism. There's more than meets the eyes when you watch Washington Capitals goaltender Olie Kolzig put his 6-foot-3, 221-pound body in front of shots that often reach 100 mph or more. "You've got 4 by 6 feet of space to shoot at. But I've often felt that you could put a soccer net behind him and he's still give you nothing to shoot at," Hall of Fame defenseman Scott Stevens once said of Kolzig. "Our team has always been pretty strong mentally, but he seems to be able to intimidate us ... get into our heads." What Stevens said next was that "Olie the Goalie" should have been the No. 1, No. 2 and No. 3 stars of the game. Intimidating. Working mind games on shooters. Ultra-competitive. Add to that a staying power and loyalty to the Capitals that is rare in this era of free agency. 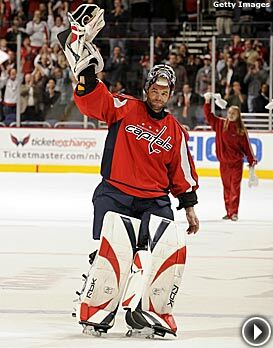 On March 12, the 37-year-old Kolzig beat the Calgary Flames to become the 23rd goalie to post 300 career wins. Again, there's more to it than a nice, round number when you are talking about Kolzig, who became only the fifth goalkeeper to reach 300 wins with the same team -- joining Turk Broda (Toronto), Jacques Plante (Montreal), Martin Brodeur (New Jersey) and Mike Richter (N.Y. Rangers). The tall, handsome goalie has become a poster boy for all things good in charity work for kids in the D.C. area and Athletes Against Autism. He's an engaging individual who could make his living selling encyclopedias if he wanted. The 300th career win came during a stretch in which the veteran goalie's 15-5-3 record since Christmas was helping lead a basically young group of players like Alex Ovechkin, Alexander Semin, Nicklas Backstrom, Brooks Laich, Boyd Gordon and Mike Green in search of the team's first playoff berth since 2004. "I'm just a big kid at heart ... always have been," Kolzig told me earlier this season. "I've still got those competitive juices that flow inside me. I feel I can still play at a high level. I know it's a kid's game and you have to have that kind of mindset. That's where the kid comes out in me." "I trashed the locker room, I was so mad," he recalled. "I wrecked two stationary bikes, and the strength coach let me have it." Olie was embarrassed, knowing that wasn't the example he wanted to set for his own children or the many sick and underprivileged kids he's worked so hard to assist. "I've tried to change my life so that I no longer act like a spoiled brat with my temper tantrums," Kolzig told me. "Those kids need heroes to look up to with the way they've been dealt bad health or a bad family life. They can sure bring you back to earth, even if you thought you were having a bad day." More than that, he wanted to be a great father figure for his children. Fast forward 15 months after Olie and Christin welcomed their first child, son Carson, into this world. There were a few short rings of the phone. The words that followed seriously shook up a guy who showed how unshakeable he could be in the spring of 1998, when Capitals' fans called him "Godzilla," the monster who almost single-handedly took Washington to the Stanley Cup before losing to Detroit. "It was supposed to be a routine checkup," Kolzig recalled. "You know, 15-month immunization. That sort of thing. But the doctor observed autistic tendencies while watching Carson and, after asking Christin a battery of questions, suggested she take him to see a specialist. "Suddenly, hockey did not matter. It was devastating ... like our whole world had been turned upside down," Kolzig said. "My wife's on the other end of the phone and I was trying to keep her calm and keep my own emotions in check, because at first you feel like you're the only people in the world facing this disorder. And for your 15-month-old son to be going through this. … I know I felt like I was numb." Olaf Kolzig's mask serves as a daily reminder of what he is playing for. "All the things you planned for your son -- simple things like playing catch, kicking around a soccer ball -- were taken away from us," Kolzig said. "I remember often coming home from a long trip and Carson didn't want to have anything to do with me. It was like I was a stranger. It broke my heart." Finally, the Kolzigs found an effective combination of therapies and Carson began to show signs that made Olie and Christin optimistic. Eye contact was better. Speech was improved. Coordination followed. "Then one night Carson climbed up on my lap and for the first time he said; 'I love you daddy.' " Kolzig said, fighting back the tears. "You learn to enjoy the small victories, you know. Being a kid and being sick shouldn't go hand in hand. My heart has gone out for kids with cancer, kids with all sorts of other illnesses. But autism is the most baffling. "I know Christin and I have often talked about all of the questions the doctors asked us. It suddenly hits you. You wonder; 'How come we didn't notice that? Like why Carson wasn't happy to see dad when he came home from the road? Why he'd be off in his own little world and just stare into nothingness? Why you could call his name and he wouldn't respond?" Kolzig talked with former Cincinnati and New York Jets quarterback Boomer Esiason about his work combating cystic fibrosis since learning his son had that disorder. Olie joined with former Capitals teammate Byron Dafoe along with long-time NHLer Scott Mellanby, who also have autistic children, to form Athletes Against Autism. Speaking engagements on behalf of autism are commonplace for Kolzig, as are offseason fund-raising golf tournaments. The goalie who stares down the greatest shooters around the world will never turn down the opportunity to try to generate funds for research to help prevent and treat this disorder. Meanwhile, Kolzig reports there has been more and more good news on the homefront. "Carson is playing soccer now on a team and our goal that he mainstream at a non-autistic school is getting closer and closer," Kolzig said. "He's a high-functioning little boy now." Hockey still matters for Olie Kolzig, but as you have just learned, there's much, much more to this often intimidating and ultra-competitive athlete than meets the eye.